Leah Farmer | Happy New-ish Year! Longest day of the year. This year made extra special by also being a full moon. I read in three different places this morning that Summer Solstice is considered a good time to reexamine many of the areas of New Year commitment made in January. My hopes in January were many. I expected to have lost a bunch more weight and to be able to run a 1/2 marathon this summer. I expected to finish the novel I started in early winter of 2015. I expected to be open, blissful, playful, and spontaneous. In January, I was at a job I hated and did not know then that I was about to be bullied by some really bad people, treated as throw-away by management, and plummeted into the worst PTSD depression I’d ever faced. In January I was still hopeful, by March I was spending some part of each day with my head between my knees hyperventilating. It is June and I’ve left that horrible job. Saving myself when no one else would come to my aid or rescue. It is June and I have spent some very important time with my therapist working through the worst of the bullying and the old stuff that it brought up. Even more importantly, she and I have found our way to some areas of my life that I want to change and begun that work. It’s June and I’ve made some amazing connections by starting a Healing Writing Circle in my home…something I wanted to do in January but didn’t feel strong enough for just then. It’s June and I’m planning to pick my novel back up as part of NaNoWriMo Summer Camp in July. It’s June and I’m ready to start again. I’m ready to live from my heart. I’m ready to connect. I’m ready to love. 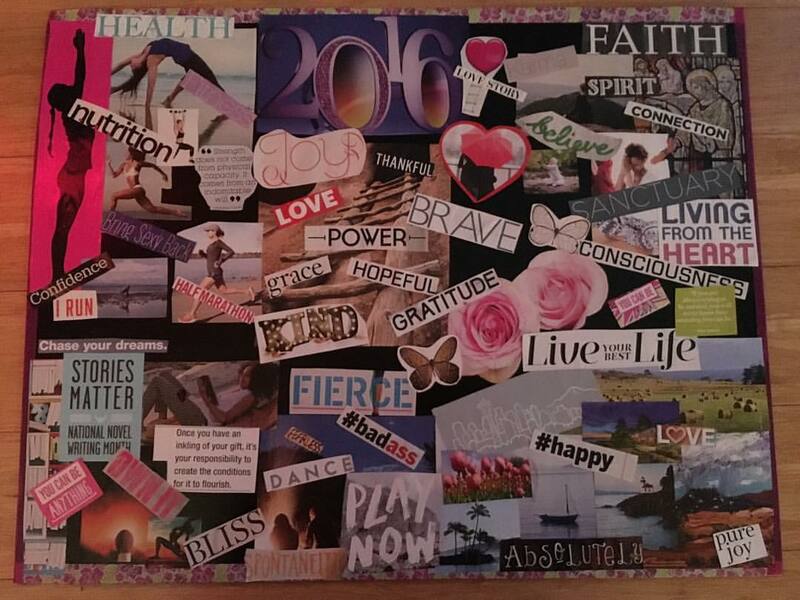 I’m ready to start living each of the areas of this vision board. 2016 isn’t over yet…it’s just getting started! Happy New-ish Year!